I was up before the sun and outside waiting for its arrival. We had only one overnight stop in lovely Nafplio Greece and I knew my camera and I would find good pictures here in the morning light. Our hotel was at the water’s edge, facing the old fortress that guards the small harbor. 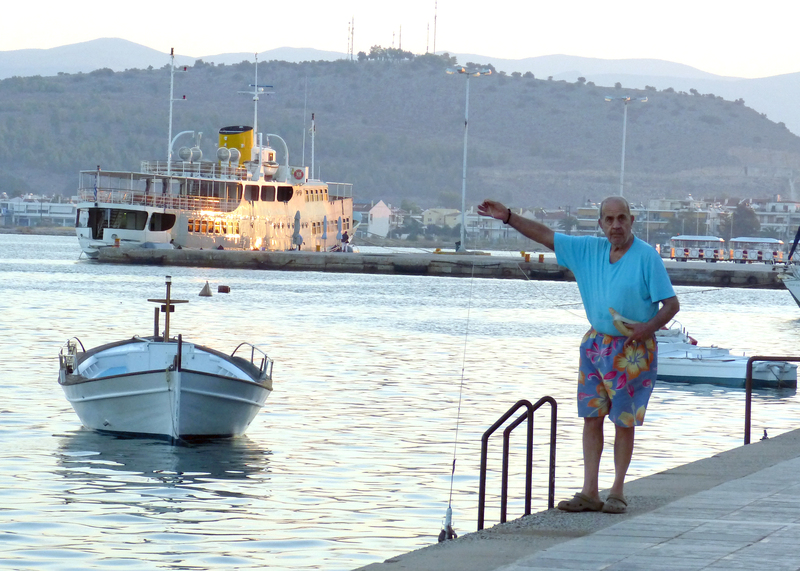 I saw a few fishermen set off for the day in small boats and an old man fishing for octopus. Then the sun peeked over the hills and the water came alive with color. 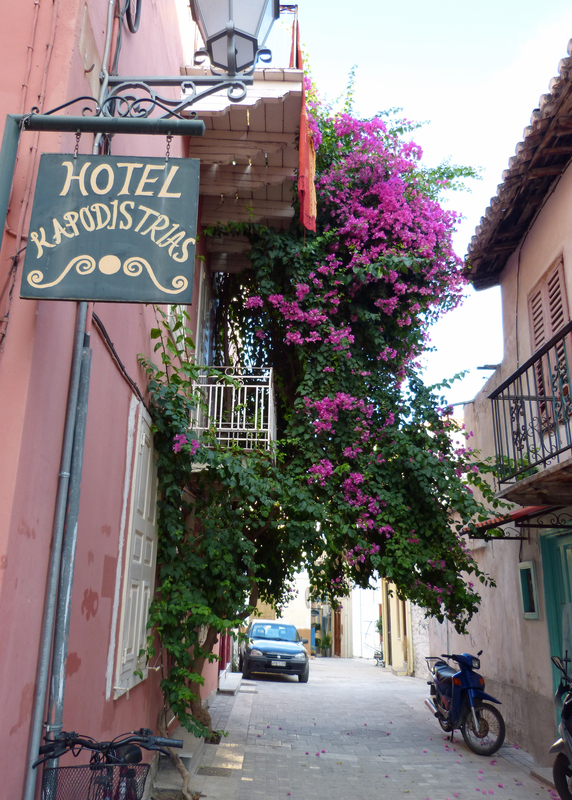 I wandered into the center of old town in Nafplio looking for more scenes to capture. I walked through Constitution Square, past the best gelato shop, and through narrow streets illuminated by the morning light. I found a small café and had a fine breakfast of Greek yoghurt and fresh fruit and strong black coffee. It was a morning to remember. Nafplio is a popular tourist destination but the season must be short because we found few tourists there in mid-September. What I did find were small “pensions” (B&B’s) and cafés that I’m sure are worth investigating. I look forward to returning one day to explore and enjoy this lovely place. I’m very grateful to my friend and client Wally Jamerson, who visited Nafplio as a child, for telling me about it. See my pre-visit blog entry about Nafplio here. Mykonos may not be a “little known place” but it is a delightful place to wander through with a camera in hand. Mykonos is one of the most popular islands in Greece and I’ve heard that it’s very crowded in summer. I was there in mid-September and, while it was busy, I wouldn’t call it crowded. I’ve created a quick slide show of a few of my favorite photos. I hope you’ll enjoy them — and I hope this works! It’s my first effort at inserting slides into this blog. A few days ago I returned from three-and-a-half weeks in the Mediterranean region including 11 days on the exciting Star Clipper. 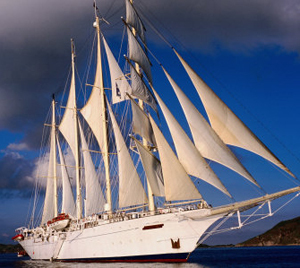 While I collect my thoughts and organize my photographs, I will share this with you: a beautiful video of the Star Clipper, the world’s tallest sailing ship. A very professional video has just been posted on the Star Clipper company’s blog. It’s less than three minutes long, but it will give you an idea of how thrilling it can be to sail on this beauty. I hope you’ll follow this link to see it. One of the places we will tour during our September cruise on the Star Clipper is Olympia, Greece, site of the ancient Olympic Games. The games were held here from 776 BC until 393 AD. Today’s visitor find columns and other pieces of ancient structures. There is a small museum at the site which holds a number of important relics. 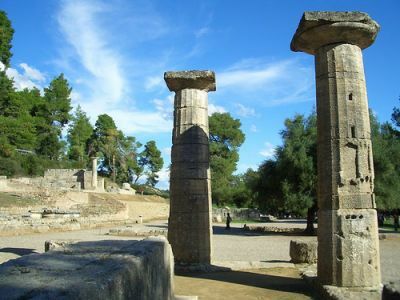 Nearby, the modern town of Olympia is well suited to cater to the visitors with some very nice hotels, a lot of restaurants and tourist shops, and some nice beaches within a half hour drive. In our time the flame of the modern-day Olympic Games is lit by reflection of sunlight in a parabolic mirror in front of the Temple of Hera which is then transported by a torch to the place where the games are held. There’s a site with a gallery of photographs of this area here: http://www.olympia-greece.org/olympiagallery/index.php. I hope the owners of that page don’t mind me borrowing the photo at the top of this page – I’ll replace it with one of my own soon. When I began my blog of “little known places” I intended to write not only about places I have visited but also to record my research into places I hope to visit in the future. 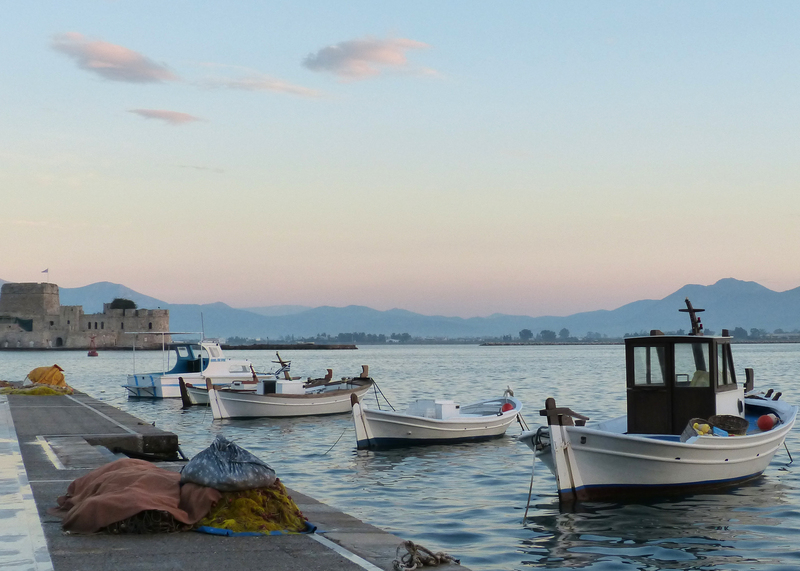 In the very near future – on September 11 and 12 – I’ll be touring the Pelopennesia peninsula of Greece and overnighting in the delightful city called Naplio. Soon I’ll be posting my own photographs of Naplio, but for now I’ve “borrowed” one from Wikipedia (above). And I’ll be telling you my impressions of this small city (population about 15,000). For now I’ll share a few paragraphs found elsewhere on the `net and some links I like. According to mythology, the town was founded by Náfplios, the son of god Poseidon and the daughter of Danaus (Danaida) Anymone. The town’s history traces back to the prehistoric era when soldiers from here participated in the Argonautic expedition and the Trojan War alike. The town declined during the Roman times and flourished again during the Byzantine times. Frankish, Venetian and Turkish conquerors left their mark in the town and strongly influenced its culture, architecture and traditions during the centuries. Ancient walls, medieval castles, monuments and statues, Ottoman fountains and Venetian or neoclassical buildings mesmerize the visitor with their unique architecture and beauty.” (From the site of the Greek National Tourism Organisation. Our first stop will be at the Corinth Canal where we’ll have a view of this deep, narrow waterway that’s less than four miles long. Little used today, it was an important short cut to Athens when it was built in the 19th century. Far older, Mycenae, is one of the most important archeological sites in the country. Mycenae was one of the major centers of Greek civilization in the second millennium BC. It was a military stronghold which dominated much of southern Greece. At its height in 1350 BC the citadel and the lower town had a population of at least 30,000 people. Highlights still visible today include the Lion’s Gate and the Tomb of King Agamemnon. 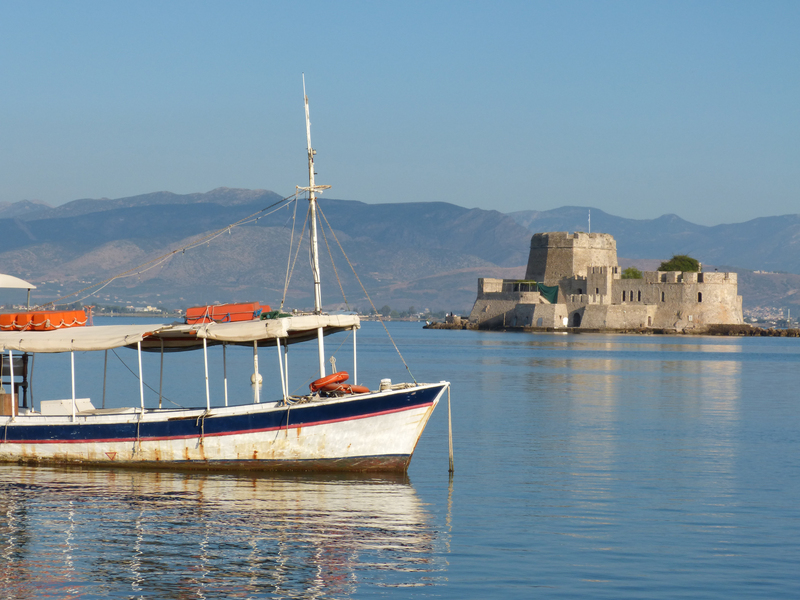 As we approach Nafplio we’ll go to the fortress of Palamidi, built by the Venetians in the 18th century. Located on a small mountain, today it’s best known for its views over Nafpoli and the sea. 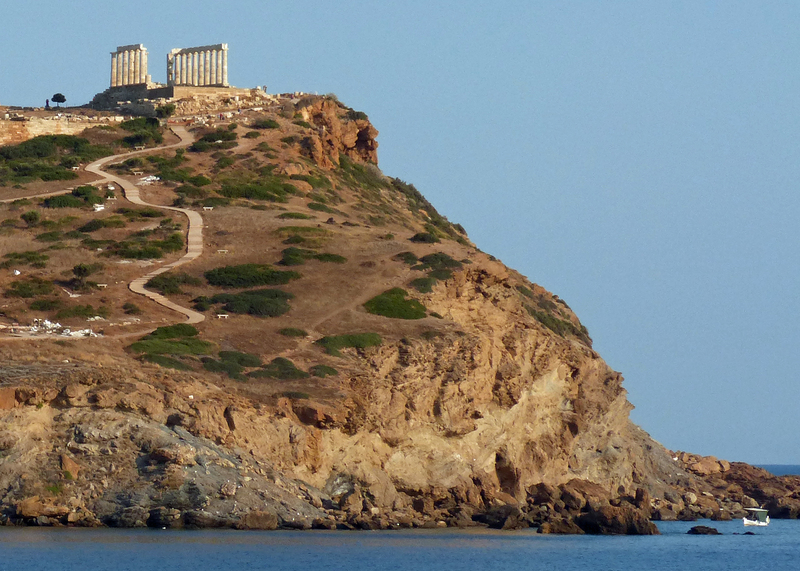 There are links connected to these names as well: Corinth Canal, Mycenae and Palamidi. Our tour of Greece has been planned by Lori Messina of Windmills Travel and Tourism in Mykonos. (Tel. +30 (22890) 23877; Lori@windmills-travel.com). Lori, an American who has lived in Greece for a number of years, has been a pleasure to work with. She’s created a terrific tour for us.